How to talk to your baby ? What are the benefits of talking to your baby? Home » Care tips » Baby care tips » How to talk to your baby ? 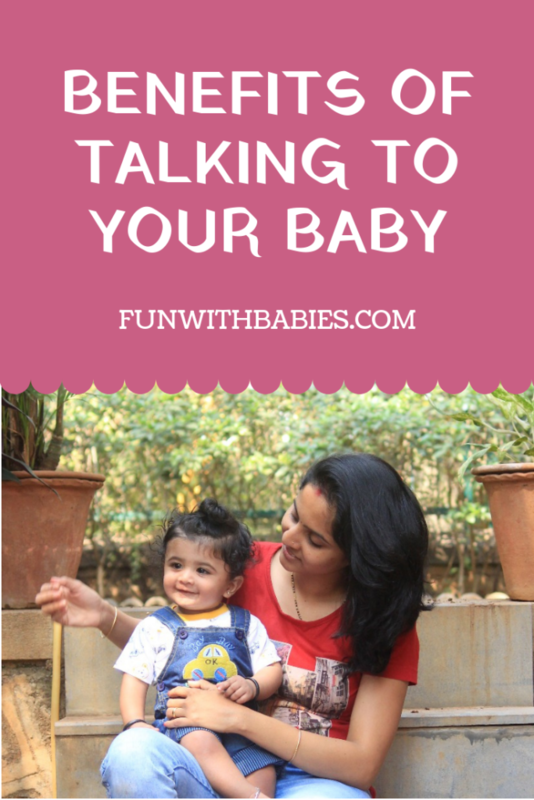 What are the benefits of talking to your baby? Everything that makes a baby develop better is always fun and play. Playing peek-a-boo, changing diapers, caring for them, talking to your baby, everything that you do for them is contributing to their brain development and overall development. Research shows that 90% of the development of the brain is done during the first 3 years of a baby’s life. With all the activities like eating, sleeping, playing and crying a child’s brain is a work in progress. Wondering what to do with you little baby? The best thing you can do is talk to your baby. Your baby is like a sponge soaking up all the words you use. The baby is learning languages you speak. In case you fluently speak more than one language in your house , it is very beneficial for your baby too. A baby’s speech is like a plant you have to nurture him/her with lots of talking similar to watering a plant daily. But confused in How to talk to your baby ? Let us help you a little with that, once you begin you will become a Pro by judging your baby’s reactions. It seems silly in the beginning, but once you see the benefits you will love this interaction with them. They will be more vocal to you. They will communicate more with you. In turn they will be more socially and emotionally secure. It is seen that if parents are talkative the kids also turn out to be talkative. Your baby may not be able to answer your questions. You can ask any silly questions like “What is baby doing?”, “Which color should mommy wear today?”, “Where is baby’s daddy?” etc. After asking the question go ahead and you answer your baby’s question. One day your baby might just start making a sound in response. It can be any small response by gurgling or cooing happily. At this point you still have to provide an answer loudly like “Blue color!! Good choice” or “Daddy’s gone to office!! Oh he will be back soon!!”. This is how you start conversation with your baby. This will help kids converse with you as they grow. Explain everything you are doing to your baby. Narrate the process of Nappy change like “Mommy is changing baby’s (preferably name of your baby) dirty nappy. We are going to put on a fresh one!! !”, “Mommy is going to make Dal and Rice in the kitchen while Grandma is going to take care of you! !”, “Mommy is reading a book” add somethings about those books. You can talk about the weather. Explain them the surrounding noises, surrounding interior stuff. During bath time you can tell which of their body parts are you washing. 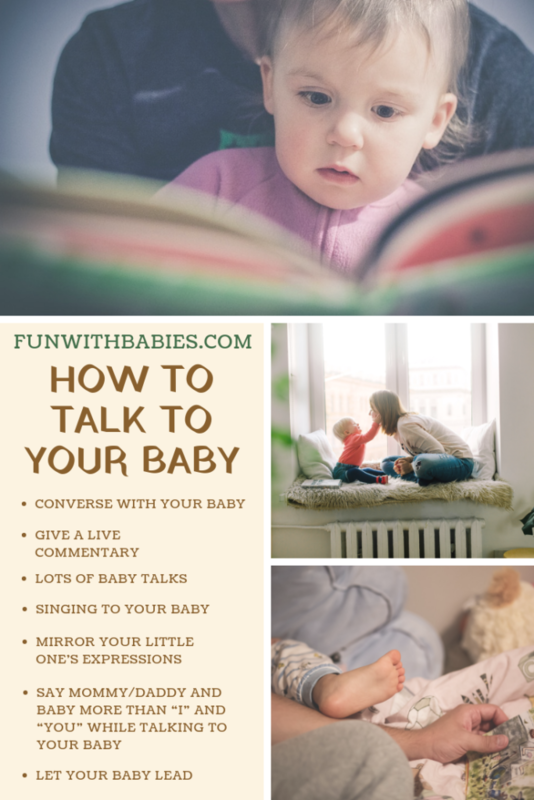 This will help you get started into talking to your baby and also will give you a lot of topics to speak about. Your baby can be your new best friend!! Baby’s love baby talk. There are research which suggests babies prefer high pitched, voice with intonations over the plain ones. I think that is why God gave us moms (Ok! Most of them) high pitched voice compared to the dads!! If it comes naturally to you, best!! Use your animated voices, narrate stories about animals and their sounds. 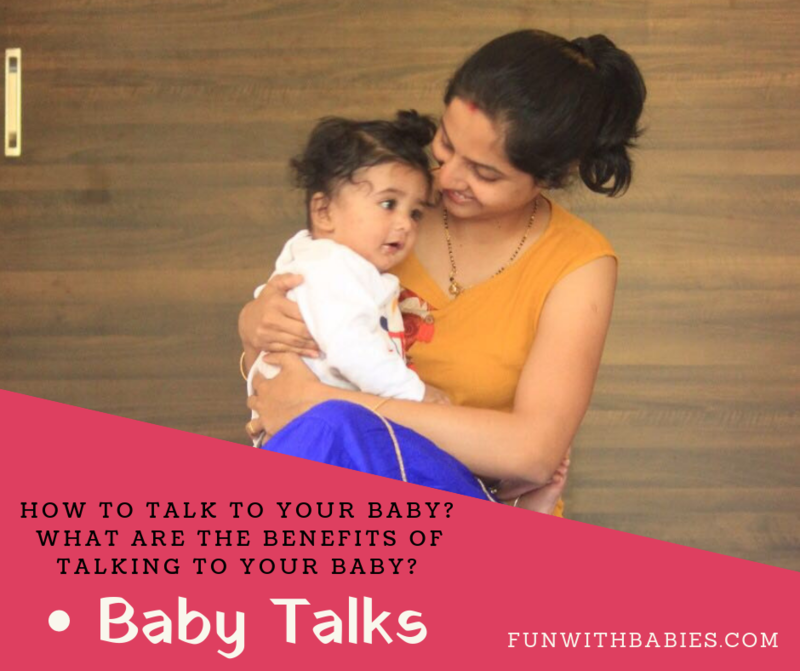 Talk regular stuff also in baby talk!! Stretching the words in the end, High pitched notes in between. Once in a while speak normally to your baby, so he knows how the words sound in a daily conversation. But if you are not much into a baby talks, do not worry at all. Talking to your baby is important. Babies love to hear their mother’s speak because that is the only voice they recognize from the womb. If other members of the family like Dad and grandparents or primary caregivers keep talking to the baby regularly, the baby will start recognizing and enjoying their talks too. There might be some babies who like low pitched voices. It’s all about trying and testing what your baby likes. Do what your baby loves and there is nothing more beneficial that that!! Reading books to your baby is very good for them. It is never too early to begin reading books to your little one. Simple board books with pictures, story books with big pictures any reading material is good. Read it out loud to them. If you feel like reading some books your age, no worries read that loud too. Your baby’s brain is soaking up all the words for future use. Baby may not understand but their brain is certainly registering those words. 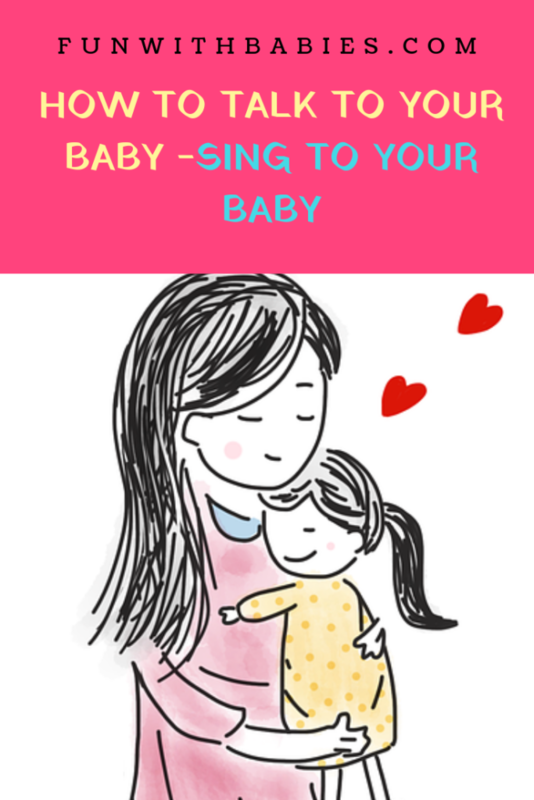 Sing to your baby right from the day you know you are pregnant. I know it is miraculous but your baby can hear your voice right from inside you. Also from the day your baby is born you can sing for her. Your baby might even recognize your voice. Sing for her as you rock her to sleep. In somedays she will be waiting for you to sing. You can even calm her when she is cranky by rocking her and singing to her. In most cases this works. Don’t worry about how you sing? You need not be a rockstar or great singer. Baby’s don’t know their singing basics yet!! If you do not know any songs or lullabies go for rhymes from your nursery days. For example “Twinkle Twinkle” , “Johny Johny”, “Nani teri morn ko(Hindi)”, “Lakdi ki kathi(Hindi)” etc. I used to listen “Hanuman Chalisa” and sing it to my baby during my pregnancy. When in womb he used to kick when I sang that song and once he was born he would love to hear it. He used to calm down instantly even in crying bouts as we played that song. Be a mirror to your baby’s expression. Repeat the sound they make. There is nothing more they love than playing with you. This will become their favourite game soon. When they say oooooh say oohhhh back with a stretch. These are the baby’s first attempts at talking to you. Babies might not be able to understand I and you or other pronouns until they grow. Speak to them addressing yourself as “Mommy” or “Daddy” and speak of them as “Baby” more than you. For example you can ask “Is the baby hungry?”, “Is Daddy wearing baby’s favourite T-shirt?” etc. If the baby is giving you any signs of all the talking being enough, take the cue and let the baby have some silent time. Baby’s preferring some silent time is also a part of their developmental process. The cues that the baby has had enough are turning away from you, becomes cranky, irritating looks, closing eyes, yawning etc. If your baby looks irritated give it a break and start some other time. Children will have a larger vocabulary growing up. Enhances a baby’s learning and communicating skills. Babies who are talked to more often might turn out to be more socially involved. Speaking positive words around them will inculcate a positive outlook in their life. You are your baby’s first teacher to teach them about life skills. You are the first one to teach them skills like building trust, understanding emotional and physical needs and also interacting with other people, learning etc. Learning to read needs kids to have a huge vocabulary. This vocabulary is developed over years of parents, relatives, caregivers speaking to the baby. So talk for your baby a lot in this “Brain forming” period and give them a head start in the lifelong journey of learning. Thank you for reading our article!! Time to share the article to all the moms and dads you know!! Share on Pinterest, Facebook and Instagram!! Spread the love and make sure we reach all the babies.